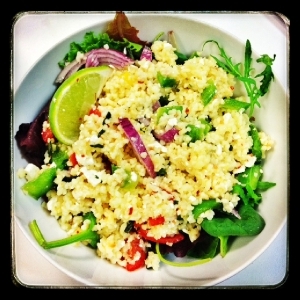 In my quest to try out some new lunch ideas I thought I would give bulgur wheat a go. I made this recipe the night before and left it in the fridge overnight and it was absolutely delicious! Really easy to put together and the bulgur wheat makes a nice change to cous cous! Cook your bulgur wheat according to the packet instructions. Mine need to be boiled for 15 minutes and left to stand for 10 minutes. Put your cumin in with the bulgur wheat before you boil it. Meanwhile chop up the rest of your ingredients, combine everything in a bowl, add in the bulgur wheat once cooked and finally mix in your lemon/lime juice. Serve with a handful of salad leaves or a pitta bread if you fancy!